PHILADELPHIA -- Congratulations on the starting gig, Brock Osweiler. Now go beat the best team in football. Osweiler will be under center for the first time since January with Houston when the Denver Broncos (3-4) visit the Philadelphia Eagles (7-1) on Sunday. He has a tough task in a game that Broncos must win to prevent from falling further behind in the standings. "This week is not about me," Osweiler said. "This week is solely about our team finding a way to get a win on the road in a hostile environment against a great opponent. We know we have a huge challenge." The Eagles have won six straight games and six in a row at home, going back to last season. Their average margin of victory in the past three games at the Linc has been 20 points. "Starting with the best is a good way to make a statement about us getting back on track," linebacker Shaquil Barrett said. Osweiler was 5-2 as a starter filling in for Peyton Manning in 2015. He returned to the bench as Manning and the defense led the Broncos to a Super Bowl victory. Osweiler signed a big contract with the Texans after that season and went 9-7 in 2016, including 1-1 in the playoffs. He was traded to Cleveland, released and came back to Denver as Trevor Siemian's backup. "He has experience on the big stage," Broncos coach Vance Joseph said. "I'm hoping that move can simply stabilize the offense so that we can get into a fair game so we can win some football games, or to simply see where we're at as a football team." There are no quarterback issues in Philadelphia. 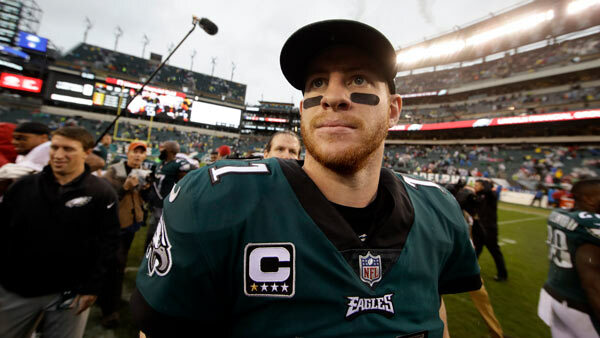 Carson Wentz is having an MVP-caliber season and is a major reason why a team that wasn't supposed to be ready to contend has become a front-runner to win the NFC. "He's a great quarterback," said Broncos safety Will Parks, who grew up in Philly. "His maturity level is at an all-time high. He's not turning the ball over a lot. He's doing a good job as far as reading his targets and throwing them. It's going to be a pretty good challenge for us, but a challenge we'll be ready for." PROTECTING WENTZ: The Eagles had a tough time against San Francisco's aggressive, blitzing defense. Wentz was sacked three times and took several more hits. They somehow have to find a way to keep Von Miller off Wentz. Miller normally rushes from the left side so he would go against right tackle Lane Johnson. But with Halapoulivaati Vaitai filling in for nine-time Pro Bowl left tackle Jason Peters, Miller could line up in different spots. "I would expect him to move around," Eagles offensive coordinator Frank Reich said. "He's moved over enough times that every team has to prepare for it for sure." PROTECTING THE BALL: Turnovers are a big reason why the Broncos have lost three straight games. They have 10 giveaways during the stretch and are minus-11 overall. Teams that have at least three turnovers in a game are 3-40 this season. "Winning starts with protecting the football," Osweiler said. "When you win the turnover margin and when you don't turn the ball over at all, your chances of winning skyrocket." STINGY DEFENSE: The Broncos have the league's top-ranked defense, so it'll be a big test for Wentz and the rest of Philadelphia's high-powered offense. Miller has seven sacks and Aqib Talib and Chris Harris form perhaps the best cornerback tandem in the NFL. MR. VERSATILE: Eagles safety Malcolm Jenkins is all over the place in the secondary. He plays safety in base defense, nickel cornerback in some packages, linebacker in others. "He's a do-it-all player," defensive coordinator Jim Schwartz said. "He's good in the box. He's good in the deep part of the field. He's a very valuable guy to have and he gives you a lot of flexibility to be able to handle things that come up within a season, within a game plan and in the course of a game." A NEW WEAPON: Running back Jay Ajayi joined the Eagles this week in a trade from Miami and upgrades the fifth-ranked rushing offense. It's uncertain how much work he'll get against the Broncos because he still has to get acclimated to a new offense. LeGarrette Blount is having a fine season for Philadelphia so Ajayi doesn't have to be a workhorse.